The issue found by Barak and Anna is an improper handling of CORS headers. Specifically what the StackStorm API returned for Access-Control-Allow-Origin. Prior to 2.10.3/2.9.3, if the origin of the request was unknown, we would return null. As Mozilla’s documentation will show, and client behavior will back up, null can result in a successful request from an unknown origin in some clients. Allowing the possibility of XSS style attacks against the StackStorm API. The fix for this is relatively straightforward, and, as of 2.10.3/2.9.3, if the origin is unknown StackStorm will return the first valid origin in the Access-Control-Allow-Origin header. Thanks again to Barak and Anna for the report, and if you are a researcher or user that discovers a security issue please reach out to moc.mrotskcatsnull@ofni. Now back to our regularly scheduled release blog. Add support for various new SSL / TLS related config options to the messaging section in st2.conf config file. Fix datastore value encryption and make sure it also works correctly for unicode (non-ascii) values. Moved the lock from concurrency policies into the scheduler to fix a race condition when there are multiple scheduler instances scheduling execution for action with concurrency policies. As always, you can check the release notes for the complete list of changes. We’ll see you again soon for 3.0. 2018 is behind us and first of all we would like to thank all of our users, community members and customers for supporting us and making 2018 a successful year. In this post we would like to have a look at the various things we have released and important milestones we have reached in 2018. In addition to that, we would like to ask you to spare 10 minutes of your time by completing the StackStorm 2019 User Survey. Completing the survey will give us a better idea on how you use StackStorm. This will help us prioritize our feature development for 2019, make StackStorm better and help you become more successful. 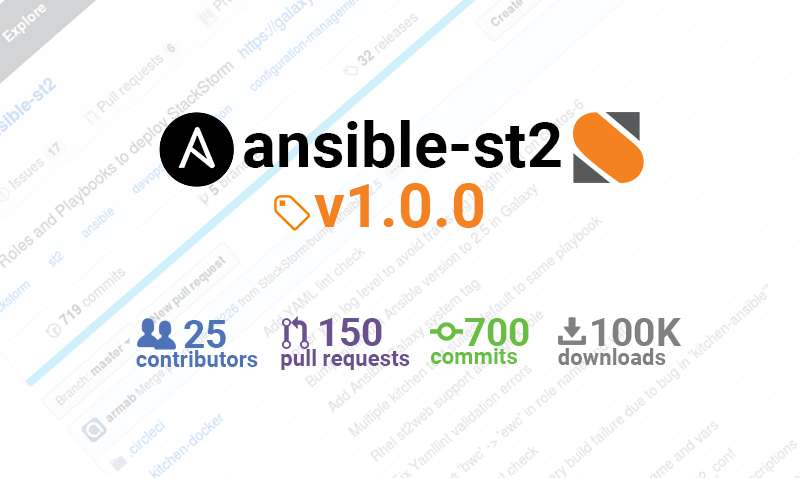 We’re very excited to announce that Ansible roles to deploy StackStorm have been promoted to major version 1.0.0! Today we are announcing the release of StackStorm v2.9.2 and StackStorm v2.10.1. Those two patch releases fix a security issue which has been reported to us this week by one of our users (Alexandre Juma – thanks! ).